Scouting helps young people achieve new heights, and sometimes those heights are really, really high. At least two-thirds of the pilots and scientists selected as astronauts since 1959 were Scouts. This stat comes as no surprise to those of us involved in the program; we know how well Scouting prepares young men and women for life and high-flying careers. Could you get the current info on how many Eagle Scouts are astronauts? I love this info when recruiting new Scouts as it makes such an impact as to the validity of the BSA program and its values. Great question. The latest numbers I could find say this: Of the 312 pilots and scientists selected as astronauts since 1959, at least 207 have been identified as having been Scouts or active in Scouting. That list includes 39 Eagle Scouts, 25 Life Scouts, 14 Star Scouts, 26 First Class Scouts, 17 Second Class Scouts, 13 Tenderfoot Scouts, three Explorers, 25 Cub Scouts, 10 Webelos Scouts, one King’s Scout, two Wolf Scouts and 32 with unknown ranks, including 27 who were Girl Scouts. This number doesn’t include Eagle Scouts who took trips to the International Space Station aboard Russian Soyuz rockets. The most recent example was Eagle Scout Kjell Lindgren, who was on the International Space Station from July to December 2015. And sisters of Boy Scouts, rejoice: Former Girl Scouts flew on one-third of space shuttle missions. That includes former Girl Scout Eileen Collins, the first female space shuttle commander. What’s the takeaway? 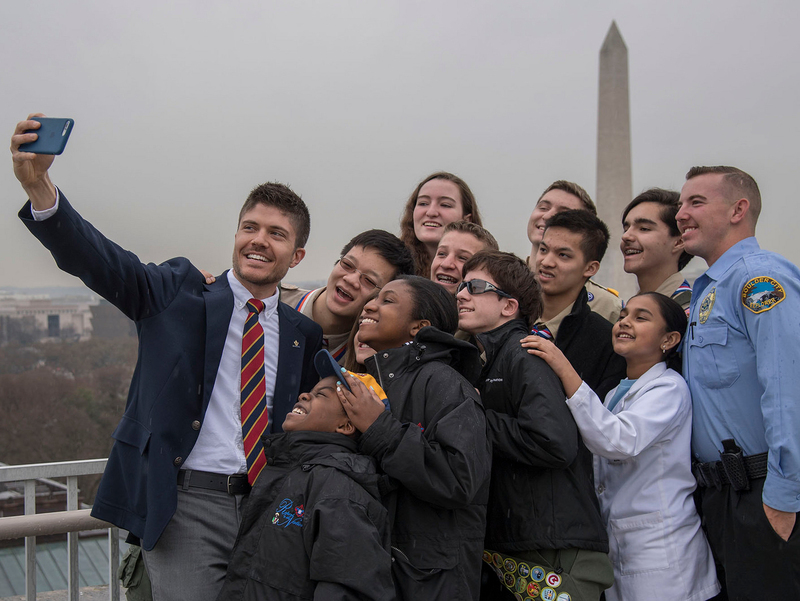 While we can’t say being a Scout will guarantee a career with NASA, we do know that Scouting’s focus on STEM and its instillment of leadership skills prepared these astronauts for a life spent exploring the cosmos. Just think what the program can do for your son or daughter. These NASA-created posters below are in the Public Domain and are not protected by copyright. Permission is not required for duplication for non-commercial use. They’re yours to use at Scout offices, camps, events and award ceremonies.